Cloth tape that will never leave adhesive residue on your cables due to its central inner layer of flexible polypropylene. Alerts staff and visitors to trip hazards. Apply to most clean, dry surfaces including wood, concrete, painted surfaces and 'cord' low pile carpets. Cables can cause a trip hazard, which is a danger to both staff and visitors if they are not out of the way or protected with a cover. If someone were to trip on a cable it could cause them an injury and lead to employee absenteeism and health and safety issues. Our tunnel tape will secure cables to the floor and cover them helping to reduce the chance of someone tripping over them by alerting staff and visitors that the cables are there. This is cloth tape which has a central inner layer of polypropylene which means it will never leave adhesive residue on your cables. They are available in a choice of two colours black or black/yellow and come in a size of 145mm x 30m. The tape can be applied to most clean, dry surfaces including concrete, painted surfaces, wood and 'cord' low pile carpets. 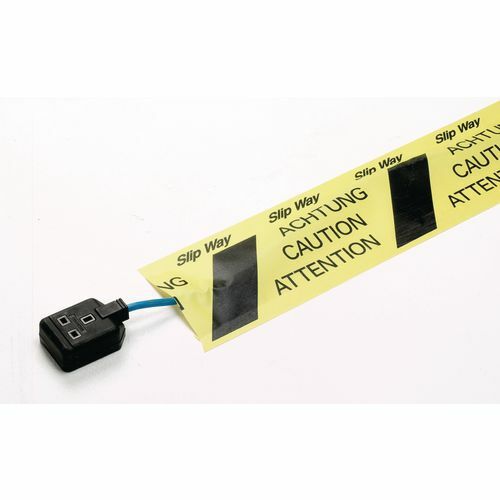 Our tunnel tape is a great way to secure your cables and reduce trip hazards in your business; they are available with a 3 month guarantee and FREE UK Delivery.